I've been considering buying a copy of this game but would appreciate any opinions on "The Regiment" before i buy it. 2) Is there an SAS training server set up on it. TR is a brilliant game. Very realistic, fast paced single player and some great missions. It has a very good training section too. Unfortunately multiplayer Coop is only 4 player. [SAS] does not have a server running in TR at present. I like The Regiment. It has options for team play at a much faster pace than RvS, and under more realistic conditions. What I personally miss, is the mission planning options you have in RvS. Also the clock timer for every mission is a scar in the high level of realism, even if it produces extra adrenaline. I Think i might get it when it goes down in price. I take it there are still no playable demos of it ? There is not going to be a demo. I agree with Rouge the lack of proper planning facilities is a great loss, and I think it is the only seriously unrealistic part of the game. 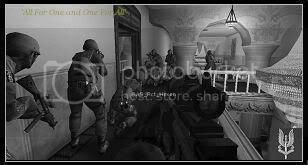 The real SAS would have spent a huge ammount of time planning their assault on the embassy, and that planning is totally missing from the game. There are no tools to help you run a coordinated team game either, no v-comms equivalent, no planning map, indeed no map at all. The maps are definitely not 1-dimensional Lockdown style, but they are not multidimensional enough. There is not enough freedom to choose your own route and strategy. There is also no dedicated-server that I can find. But, it is still a great game because the fast-paced action is very realistic, and very different to other games, in a good way. Worth the money I would say but it doesn't jump high enough on multiplayer to replace RvS. Like there is A and B movies.. There is A and B games.. this game is a B game in my opinion. I was the only one from this clan that didnt like it though. But try check out some the reviews of the game. i bit the bullet and bought the game. I might play it online with you sometime though. It's a great game for single player, or for multiplayer with a few mates. But it can never be a clan game. 4 player coop and no dedicated server rule that out. Well worth playing but don't expect a fulfilling multiplayer experience beyond playing with people you already know.